Washington D.C. -- The latest round of tests by federal scientists, quietly published in February, has documented startlingly high percentages of supermarket meat containing antibiotic-resistant bacteria, according to a new Environmental Working Group analysis. EWG’s analysis of data buried in the federal government’s National Antimicrobial Resistance Monitoring System has found that store-bought meat tested in 2011 contained antibiotic-resistant bacteria in 81 percent of raw ground turkey, 69 percent of raw pork chops, 55 percent of raw ground beef and 39 percent of raw chicken parts. EWG researchers found that 53 percent of raw chicken samples were tainted with an antibiotic-resistant form of Escherichia coli, also known as E. coli, a microbe that normally inhabits feces and can cause diarrhea, urinary tract infections and pneumonia. The extent of antibiotic-resistant E. coli on chicken is alarming because bacteria readily share antibiotic-resistance genes. As well, EWG found that antibiotic resistance in salmonella is growing fast: of all salmonella microbes found on raw chicken sampled in 2011, 74 percent were antibiotic-resistant, compared to less than 50 percent in 2002. A significant contributor to the looming superbug crisis is the unnecessary antibiotic usage by factory farms that produce most of the 8.9 billion animals raised for food in the U.S. every year. Industrial livestock producers routinely give healthy animals antibiotics to get them to slaughter faster or prevent infection in crowded, stressful and often unsanitary living conditions. Pharmaceutical makers have powerful financial incentives to encourage abuse of antibiotics in livestock operations. In 2011, they sold nearly 30 million pounds of antibiotics for use on domestic food-producing animals, up 22 percent over 2005 sales by weight, according to reports complied by the FDA and the Animal Health Institute, an industry group. Today, pharmaceuticals sold for use on food-producing animals amount to nearly 80 percent of the American antibiotics market. The federal Food and Drug Administration’s efforts to address antibiotic abuse in livestock operations consist of only voluntary guidance documents – not regulations that carry the force of law. EWG takes the position that the FDA must take more aggressive steps to keep antibiotic-resistant bacteria from proliferating in the nation’s meat supply. Livestock producers must not squander the effectiveness of vital medicines. Rep. Louise Slaughter (D-N.Y.) has introduced the Preservation of Antibiotics for Medical Treatment Act (PAMTA), aimed at curbing overuse of antibiotics on farms. “Consumers need protections on the food they eat now,” said Craig Cox, EWG’s vice president of natural resources and agriculture. “And they need a new farm bill that will help producers reduce their use of antibiotics and level the playing field for farmers and ranchers committed to more sustainable ways to raise livestock." Consumers can reduce their exposure to superbugs by eating less factory-farm meat, buying meat raised without antibiotics, and following EWG’s downloadable Tips to Avoiding Superbugs in Meat. They can also order a wallet card for a small donation and view a detailed label decoder. This project was partially funded by an educational grant from Applegate. 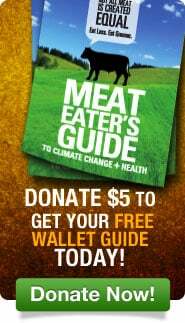 Leading chefs, authors and health experts are praising EWG’s Meat Eater’s Guide and support the consumer recommendations. Find their testimony and the full report at EWG’s website. ©2011, Environmental Working Group, All Rights Reserved.